For starters: way way waaaaay too many screens before you get to load your game. What is the god damned point of a title screen, THEN a “press start to continue” screen? You may have noticed that none of those aforementioned options are “quit to desktop,” meaning every time you want to quit you’ve got to navigate that god damned main menu again. Quitting this game on PC is a multi-step process. You’d think it’s done, but IT’S NOT. So you’re on the page where you load your save. “No problem” you think. “I’ll just back right out onto the main menu.” The game asks: “Are you sure you want to exit to main menu?” No, game, I just selected that TWICE completely by accident, I’d much rather stay on this load screen. So of course you say “yes, I am absolutely sure” and... the game quits completely. “SUCCESS” you may be thinking, as you open your internet browser, BUT HOLD ON. The game isn’t done with you yet. For whatever reason, the game then decides to boot itself back up and into the main menu as it promised you, because GOD FORBID we quit without the option to click on INITIATES. Seriously, read the above paragraph again. Where. Are. My. Shanties. 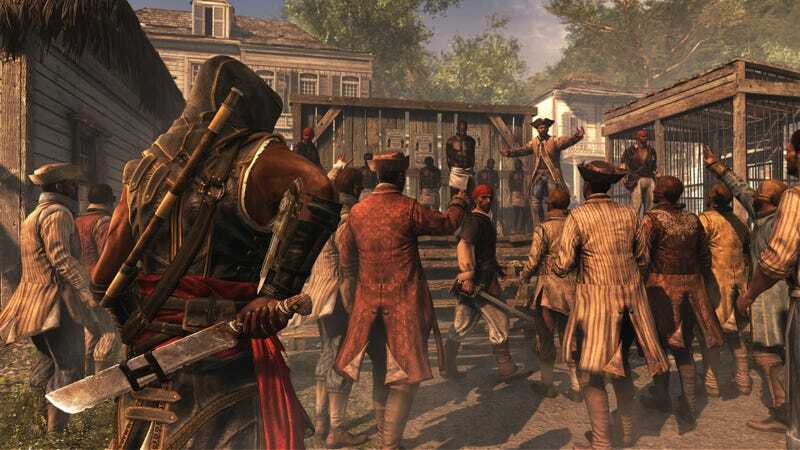 Freedom Cry is an improvement over Assassin’s Creed IV: Black Flag in a lot of significant ways. The story, the characters, even just the basic premise of why you are doing what you’re doing (to free slaves, duh), it’s all markedly improved over the base game. It’s problems are hard to fault, as they are mostly Black Flag’s (except that shanties thing, man... what the hell happened there?). There’s a kernel of a not-merely-good-but-great Assassin’s Creed game in Freedom Cry, one with clear, defined goals and a fun environment to play in. One with characters I care about and a driving force behind my actions. As a mere piece of DLC, Freedom Cry simply isn’t equipped to be all things I’d want from a Creed game, yet I can’t help but long for an entry in the main series so confident.